On November 8th, 2018 the Woolsey fire swept across the Santa Monica Mountains. It claimed 96,949 acres of undeveloped land in the mountains, making it the most extensive fire ever recorded in the region. 1,643 structures were lost, and the ecological and environmental impacts on the flora and fauna of the Santa Monica Mountains are presumably enormous. Training: Our goal is to make this a meaningful project where students with limited biological knowledge and experience can participate in the data collection and discovery phase of the work. On 27 January, we conducted a training session with Jon Keeley (NPS fire ecologist), Marti Witter (NPS fire ecologist), and personnel from the UCLA La Kretz Center and the MRT. Each student team was provided with a field kit and trained in techniques for quantifying fire severity, choosing sampling sites along their transect, constructing and laying out a 1-m sampling quadrant, photo-imaging and archiving each quadrant, and recording data. They were also trained in some plant identification so that they can ID and count plants while in the field. To quantify the impacts on small terrestrial invertebrates, students will use a standard protocol to document and count insects, arachnids, and molluscs at their transect. Wildlife camera training and installation will follow as soon as cameras are purchased. 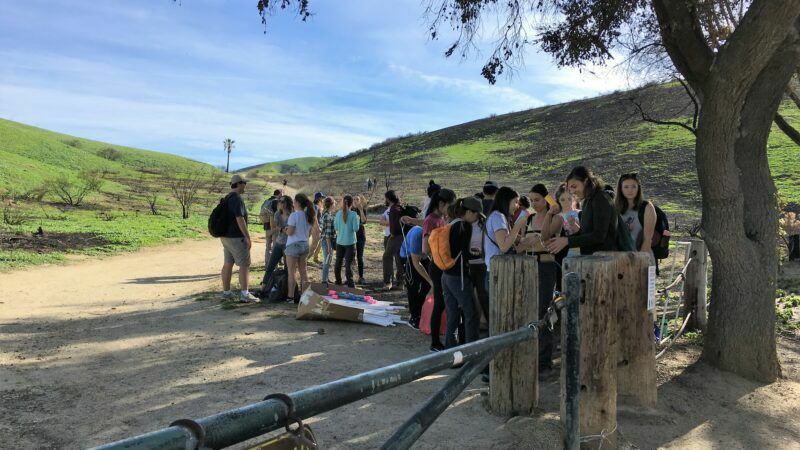 Data Collection and Archiving: Our goal is to have 50 sites, 80% of which experienced some level of burning and 20% were unburned (the latter are positive controls from the UCLA Stunt Ranch Reserve, see https://stuntranch.ucnrs.org/the-stunt-ranch-reserve/). Sites will be chosen based on 1) pre-existing data that can be used to place the burn into an ecological context, 2) general level of burn intensity as determined by the NPS, and 3) proximity to trails, safety, and ease of access. Each pair of students will be assigned one 100 m transect along a trail, road or other easy access point. At each site, the students will chose 10 sampling locations. At each site, the students will put a numbered flag into the ground and place a 1-m square PVC sampling grid on the ground adjacent to the flag. The students will count the emerging plants in each grid, and use cover boards and sticky traps to quantify invertebrates. Students will also use the “minimum diameter twig on burnt plant skeletons” protocol (Keeley, 2009) to measure fire severity (intensity, which is a function of the actual heat generated, cannot be measured, but severity is a biological property that can be quantified post-burn). Finally, we are negotiating the purchase of 50 wildlife cameras with backup storage and batteries that will be placed at each site to quantify the movement of larger mammals and birds through each site over time. The cameras can capture and store images of moving animals for a month, at which time the storage card and batteries will be swapped out by each student pair. All digital images will be stored on a cloud-based storage system for later quantification.